Unsurpassed Quality and Attention to Detail! 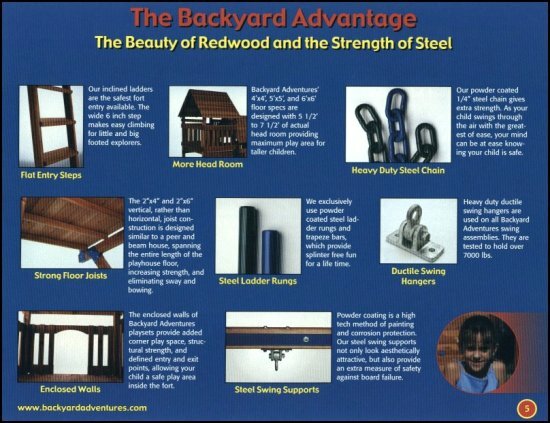 Thank you for considering products manufactured by Backyard Adventures. As you view this web site, please keep in mind that not all wooden gym sets are alike. We think you'll agree that our quality and attention to detail are unsurpassed. No potentially toxic lumber is used. All products built by Backyard Adventures are constructed of farm-harvested California Redwood. This "child friendly" species requires no chemical injection, such as arsenic, which is found in pressure treated lumber. (See Organic Gardening, Rodale Press, January 1994). Why do we use Redwood when cheaper alternatives are available? Because it's the best! Patented Compression Clamps. (Patent #5,403,110, and D383374) Our exclusive steel compression clamps are designed to provide the ultimate in strength and stability. They are used at key points which require additional structural integrity. Our compression clamps hold more surface area at each joint keeping your set strong and stable for years to come. No other manufacturer provides the engineered strength that our compression clamps create. No staple construction. All wooden members (floors, walls, roofs, etc.) are securely fastened with screws or screw nails. Staples can work loose. Exposed staples can create a hazard. 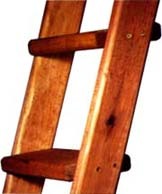 The safest Fort entry ladders available. Our entry ladders are inclined with flat steps, insuring stable footing and the safest access. Our Redwood is stained and sealed at the factory. We apply non-toxic stain and sealer on our wood to insure more uniform color and to protect the wood from such things as mildew. Redwood has a tendency to turn black if left unsealed. Not all manufacturers seal their product and others charge extra for such protection. More wood, more value. Wall designs by Backyard Adventures use more wood than many other manufacturers. Our walls create a more "private" area inside for kids while still allowing parental observation at all times. Powder-coated steel components. Powder coating is a high-tech method of painting. After a three-stage washing process the steel is electrostatically charged to a negative state. It is then introduced to the powder in a special spray booth. The positively charged powder bonds to all negatively charged surfaces, thus insuring total coverage of the surface. The paint is then baked-on in an oven. Only Backyard Adventures offers this environmentally friendly process in-house. No Wooden Dowels. We use powder coated steel rungs on all swing ladders and trapeze bars. Wooden dowels can splinter with age. Swing stability and safety. Only Backyard Adventures provides a "double braced" add-on swingset. Additional 4 x 4 and 2 x 6 supports enhance stability and eliminate swaying. Our Steel Swing Support provides a "fail-safe" against board failure. Compare our Fort sizes. Most Forts available are 4' x 6' or smaller. Our 5' x 5' design provides more play area.